Car owners of Regina know that taking care of a car is a lot of work and that it can’t be done solo. That’s why Crestview Chrysler is around to help you with even your toughest car problems — such as a check engine light that won’t reset — so that you can rest easy. At Crestview Chrysler, you and your vehicle will always be in good hands thanks to our highly trained technicians and competitive pricing. Currently at Crestview Chrysler Service Center, one of the hottest deals that we’re running right now is for a four-wheel alignment. The alignment package is only $99.95 and will provide your vehicle with all of the necessary vehicle alignment processes and more. The total package includes four-wheel computerized alignment with toe adjustment, a front and rear suspension inspection, a steering component inspection, a written report, and a manufacture’s check. Knowing exactly when it is the right time to come in for an alignment can be tricky, as there are no real bright red flags that there is a problem most times. To maintain proper vehicle safety, we recommend that you have your tires aligned at least once every 6,000 miles. If you’re one of the Moose Jaw drivers that frequently drive through poorly maintained, uneven roads or often hit potholes and curbs your tire alignment can be thrown off much easier than normal. 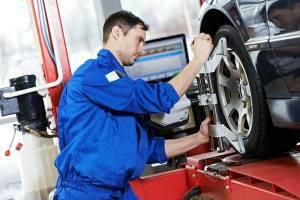 There may be some drivers that are still weary of the necessity of tire alignment as part of vehicle maintenance. As one of the most important components of a car, the tires are a key player in making a vehicle ready for the road. Making sure that tires are not wearing unevenly and that tires are always aligned is the only way to ensure that you are driving as safely and efficiently as possible. Stop by our location at 601 Albert Street or call us at 888-449-0943 to schedule a service appointment with one of the most detail oriented dealerships in the Saskatchewan area. We promise, you’ll be happy you chose to go with the caring hands at Crestview Chrysler.